A veteran city prosecutor is among the latest victims. The typhus outbreak continues to grow in the city of Los Angeles. Investigative reporter Joel Grover reports for NBC4 News at 11 p.m. on Jan. 31, 2019. A veteran Los Angeles City Hall official is one of the latest victims of an epidemic of the infectious disease typhus that continues to worsen across LA County. For months, LA County public health officials have said typhus is mainly hitting the homeless population. But Deputy City Attorney Liz Greenwood, a veteran prosecutor, tells NBC4 she was diagnosed with typhus in November, after experiencing high fevers and excruciating headaches. "It felt like somebody was driving railroad stakes through my eyes and out the back of my neck," Greenwood told the I-Team. "Who gets typhus? It's a medieval disease that's caused by trash." Greenwood believes she contracted typhus from fleas in her office at City Hall East. Fleas often live on rats, which congregate in the many heaps of trash that are visible across the city of LA, and are a breeding ground for typhus. "There are rats in City Hall and City Hall East," Greenwood added. "There are enormous rats and their tails are as long as their bodies." Last year set a new record for the number of typhus cases — 124 in LA County for the year, according to the California Department of Public Health. Last October, Mayor Garcetti vowed to clean up piles of garbage throughout the city to combat the typhus epidemic. 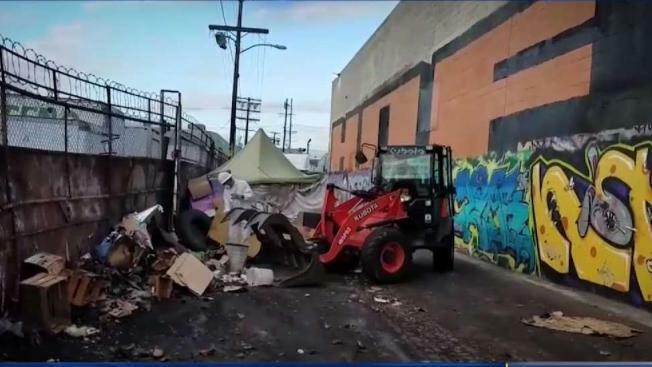 The Mayor allocated millions of dollars to increase clean-ups of streets in the Skid Row area, known lately as "the typhus zone." But four months later, the I-Team documented huge piles of garbage just outside the "typhus zone." "You can't solve it (the typhus epidemic) until you hit the cause," says Estela Lopez of the Downtown Industrial Business Improvement District, "and the cause of it is that you still have these mountains of trash." Added Greenwood: "This is a terrible illness and I wouldn't wish this on anybody. But it's not just homeless folks getting it." She believes the city should fumigate City Hall and City Hall East to protect the thousands of workers and visitors who could be at risk from getting typhus. Responding to complaints from other city workers fearful of getting typhus, LA has already fumigated LAPD’s Central Division office and parts of the LAPD’s main headquarters. Garcetti's office did not respond to NBC4's questions about why the city hasn't fully fumigated City Hall buildings as well. Greenwood says she doesn't want to return to work at City Hall East until the entire building is fumigated for typhus-carrying fleas. "I am concerned about going back to work and getting this again, because I thought I was going to die," Greenwood said.